Unpacking the Dust Guzzler revealed a product with no consumer aggravation. 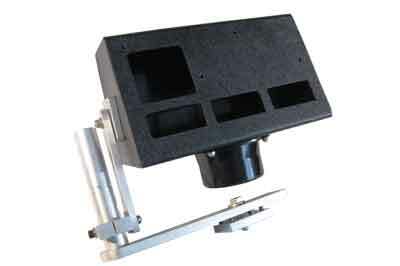 It is a simple, yet well-made plastic product with machine-milled aluminium brackets. 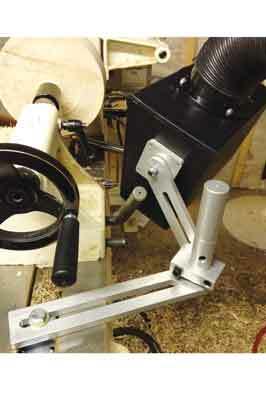 The brackets are fixed to the ways - lathe bed - with a piece of metal, which is situated under the bed ways. A bolt attaches the main bracket arm to the piece of metal under the bed ways, which sandwiches the Dust Guzzler to the lathe. Yes, I did think it was a great product, although it did seem a little highly priced considering the fact it is made purely of plastic and aluminium. The adjustment bolts have nyloc nuts; these keep the screws tight in case of any lathe vibration. Using a simple wrench, adjustable or socket, it can be manoeuvred and situated to suit all types of turning projects. It also consists of a plastic rectangular box with a 100mm hose port. There are four rectangular cut-outs: three alongside each other and the fourth above them. These holes can be open or covered, allowing for various types of turning projects to be sanded. The bottom three holes should be open, allowing you to sand spindles and other 'between centres work'. Furthermore, placing the cover over two of the spindle sanding holes reveals the larger hole above, which allows you to sand faceplate work. I can understand how some might look at this product and think that it's going to be bulky and cumbersome. However, considering the danger posed by fine dust from sanding, I believe the size of the Dust Guzzler to be irrelevant. 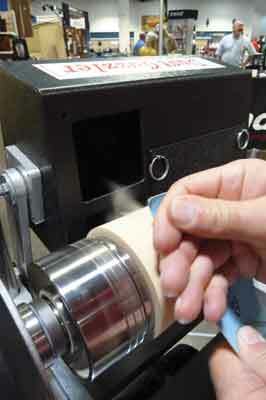 Whether on a mini or larger lathe, it can be situated very close to the work without worry or danger. On the other hand, it can be positioned as far away as the mount will allow and still do the job, as long as you have the proper amount of suction. In my opinion, this system needs to be used with a dust collection system with at least 500CFM. The Delta model 50-760, 1 1/2HP single bag dust collection system, which I have in my workshop, worked wonders alongside the Dust Guzzler while sanding both bowls and spindles. 1,200CFM is the maximum setting on this particular dust collection system, so it has plenty of strength to tackle all sanding jobs. One downside of the Dust Guzzler is the cost - at nearly £200 it is quite pricey, but it works well.